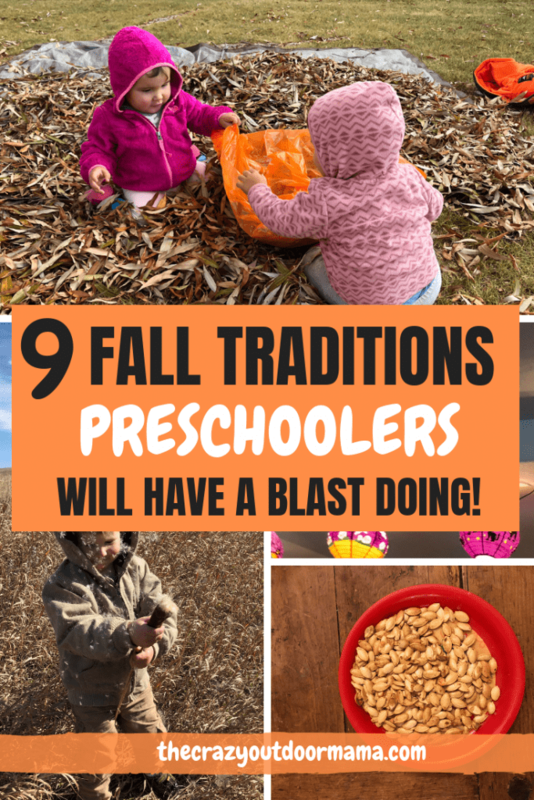 You’ll LOVE doing these fall activities with your preschooler, and now is the best time to start some traditions! 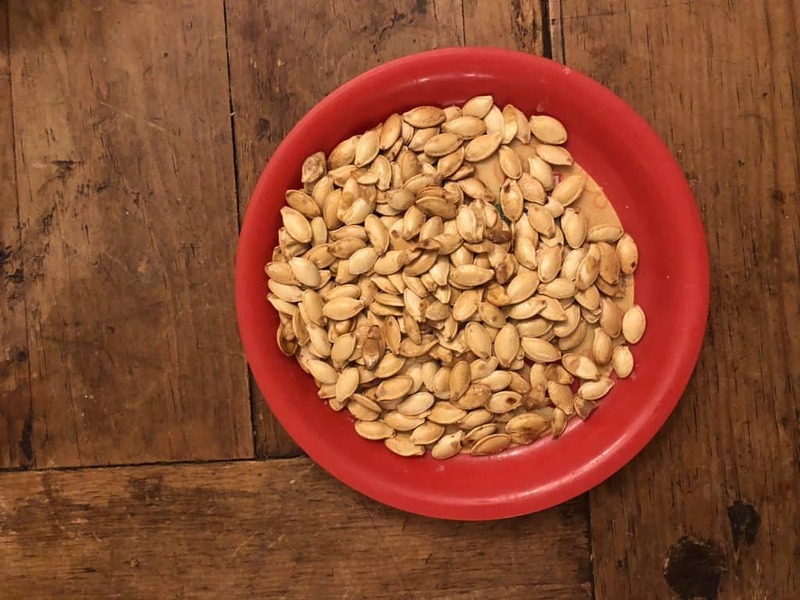 Bake the pumpkin seeds you scoop out for a tasty treat! A PERFECT fall toddler activity -Fill up some spooky themed leaf bags in prep for Halloween! Speaking of leaves.. do a fun leaf craft with your preschooler! Make a fun treat with pumpkin puree! Find a special plant that is super fun in fall to play with! Use apples for an apple craft or just drink some apple cider! And of course, attend a fall festival! 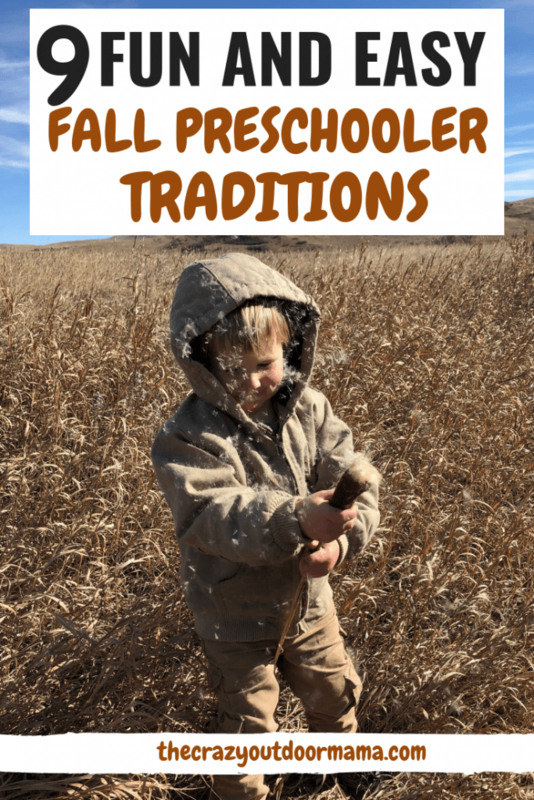 Do you have any fall traditions or activities you love to do with your preschooler? Leave it in the comments below! 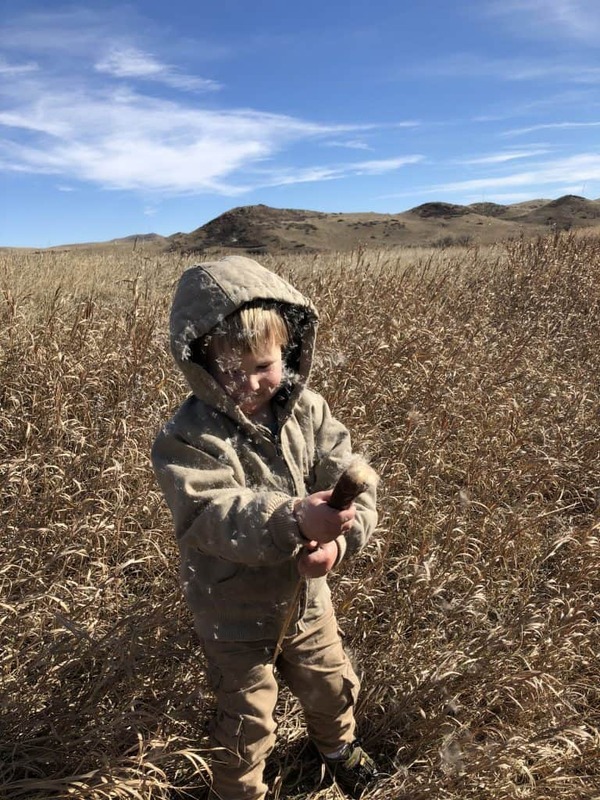 Fall is upon us in full swing, which I am super excited about because now is a great time to create some fun fall activities with your preschooler! I’m all about traditions – I can’t even watch a Christmas movie unless it’s actually the month of December because I feel like it would ruin the magic of it! So when fall comes, I think of pumpkins, leaves, and delicious ripe apples that just have so many opportunities for fun times! This year he was a little braver about it all, and while he didn’t love sticking his hand in the pumpkin, he was OK with picking out the seeds from the “guts” I put on the plate for him! 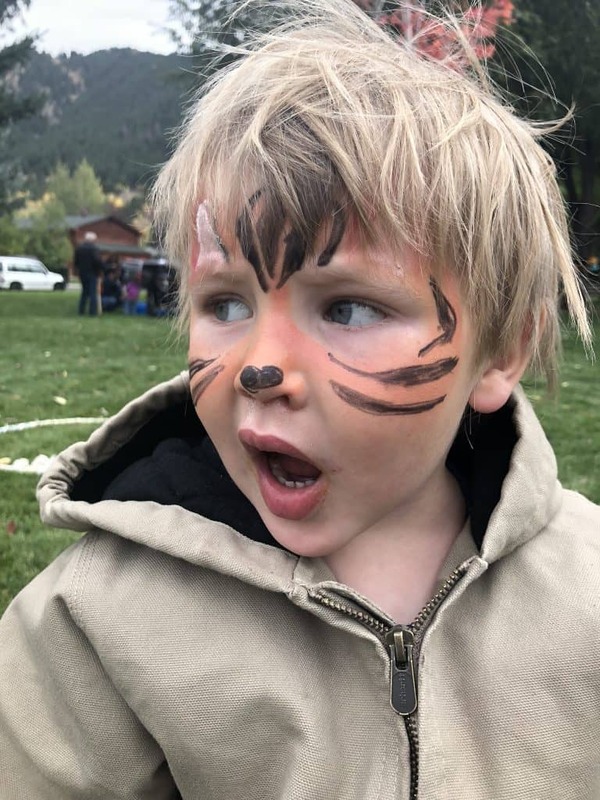 That was just one of the fun things he actually enjoyed this year – so let’s get into some easy and fun fall activities you can start with your preschooler too! P.S. 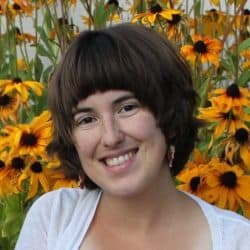 I wanted to let you know that I am an Amazon Affiliate, and will get a small commission should you buy anything through my links! This was a BIG hit with my preschooler this year, and it’s so easy to do! You just clean, dry and cook them – here are the directions to bake your pumpkin seeds! Put all the seeds into a bowl, and mix some butter and a pinch or two of salt into the seeds. Put them back in the oven for another 15 minutes or so. Take them out when browned! They kind of remind me of popcorn, and are a fun treat to make from scratch! 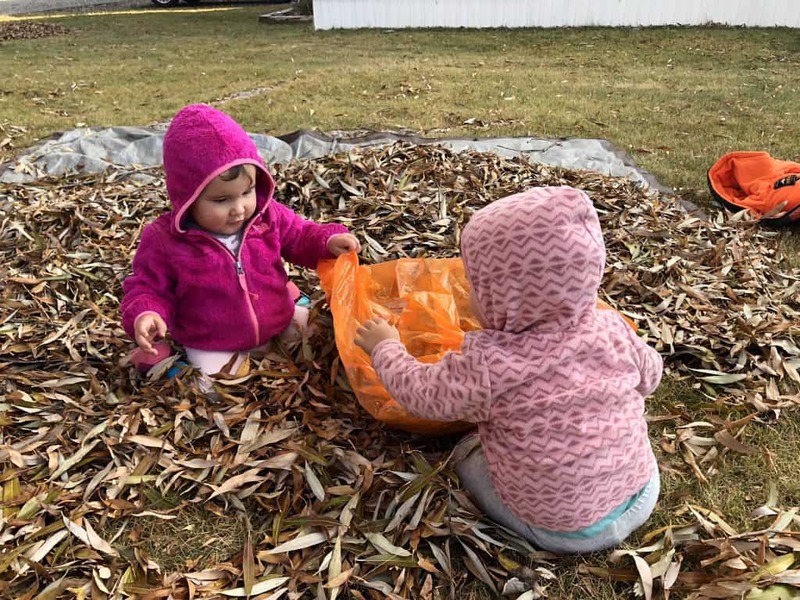 While this is more of an October only thing, it’s still a fun fall activity to clean up leaves! Putting them into decorated bags makes it even more fun and BONUS you get some chores done at the same time! Just don’t be surprised if you need to do some re-raking afterward! The normal pumpkin ones are usually available locally, but these ones (below the kid picture) are really cool and your kids will get a kick out of them! My son was all for filling the bags until the strider bike came out – good thing he had some little sisters ready to help! My little guy did this one last year and he loved it! This spider leaf bag is over SEVEN FEET WIDE! Massssiiivvee! With so many leaves around, it is easy to glue them, crunch them, collect them.. whatever your little one loves best! 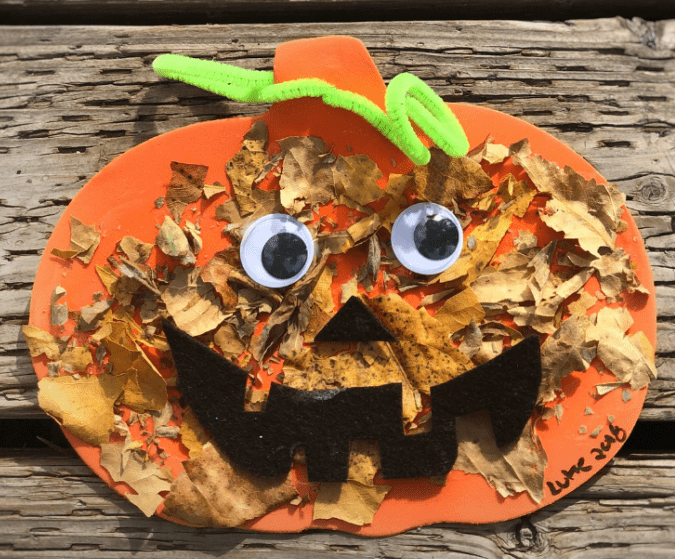 Mine loves crunching the most, so we made a “Leaf Crunch” pumpkin craft that was just as it sounds – a bunch of leaves crunched up and glued to a pumpkin! 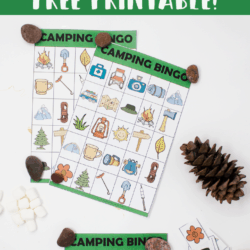 There are tons of leaf printables, coloring pages and more on Pinterest, so check it out to find more ideas! Our crunchy leaf pumpkin! Anything leaf related I love! Check out how to make this easy preschooler leaf craft! Fall is everything pumpkin in my mind, so what better way to celebrate than making a sweet pumpkin treat in the shape of a pumpkin! While there’s some pretty cool stuff on Pinterest for kids halloween party food ideas, this is the easiest way to go! Bake some spooky cupcakes and just add icing! While we have a whole box of spider webs and skeletons and such, the one that everyone loves most are our Halloween Lanterns! They kind of make the place magical in a spooky sort of way! In fact, this year they are the only decoration we put up because life is crazy! All the kids (my one year olds included) LOVE staring up at them! Another bonus is that they are fun and silly, so they aren’t near as scary as some traditional Halloween decor! I LOOVVEE paper lanterns! They are fun, fold flat to store, and just seem magical to me! I couldn’t find these exact ones (I found them at a thrift store!) these Halloween paper lanterns are super cute too! Another new one for us this year since my preschooler is finally getting it! Fall tends to also mean the end of a plants cycle, and so seeds are everywhere! The most fun ones are cat tails for us! They are super fluffy once you start messing with them, and easy to find! This will be different for everyone – think seed pods that make shaking sounds or flower heads that fall apart as soon as you touch them! These cat tails were a blast! I didn’t even know they came apart like this until my husband showed me, then me AND my son had a blast! I am lucky enough to live near my parents who have a cute apple tree that produces tons of apples! So not only do we get to pick as many as we want, but we also make use of the bad ones and do some fall apple crafts! Drinking warm spiced apple cider is another way to celebrate the chillier weather and falling leaves! It’s easy enough to make – pour some cider into a pot, add mulling spices, and wallah! 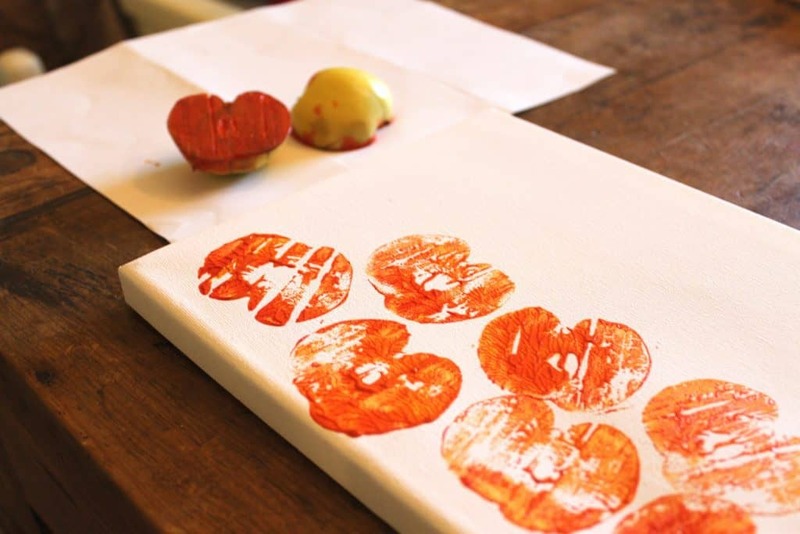 If you want to do an apple craft then try apple stamping! It’s a great way to use worm-eaten apples, and they happen to look like a pumpkin when cut in half! Check out this cool “pumpkin patch” apple craft you can make with your leftover apples! Half way through our apple stamping – check out how to make your own apple stamped pumpkin patch! This is something probably pretty obvious, but don’t skip out on them! A lot of the fall festivals cater to fairly young kids and have some pretty easy games! Not to mention it’s just another easy excuse to make to go out an enjoy the scenery! 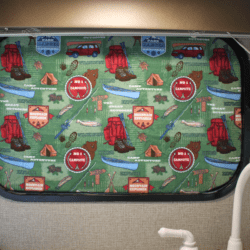 The great thing is that no matter how big or small, your kids will likely enjoy it! I went to this super small one and it was wonderful because they had handmade games, face painting, and creative fall activities for the kids! While I normally hold out for the bigger festivals with more amenities, I’m learning kids don’t need much to be happy! In fact, over half the time we were at that festival he was “fishing” for stapled together paper fish with a magnet at the end of a fishing pole. And he had. a. BLAST! Face painting is always a hit with the kids at ALL carnivals! And this fall carnival was no different! I’m still new at this guys, and love to hear new ideas! My girls are only one, and there is plenty of time to start even more fall traditions with them!